But why limit this to your Christmas dinner? We found that a helping of the stir-fried Brussels sprouts went very nicely with a bowl of dhal and brown rice. I make my dhal differently every time, depending on how I feel and what I have to hand. Here’s a recipe for a particularly delicious one – kill-a-cold lentil curry. You could even give this vegan recipe centre stage and make it the main part of the meal. Just add some cubed tofu a couple of minutes after adding the sprouts to the stir-fry. The Brussels sprouts are slightly crunchy and the slivers of ginger, garlic and chilli give a warming spicy glow. Perfect fare for a cold winter’s day. 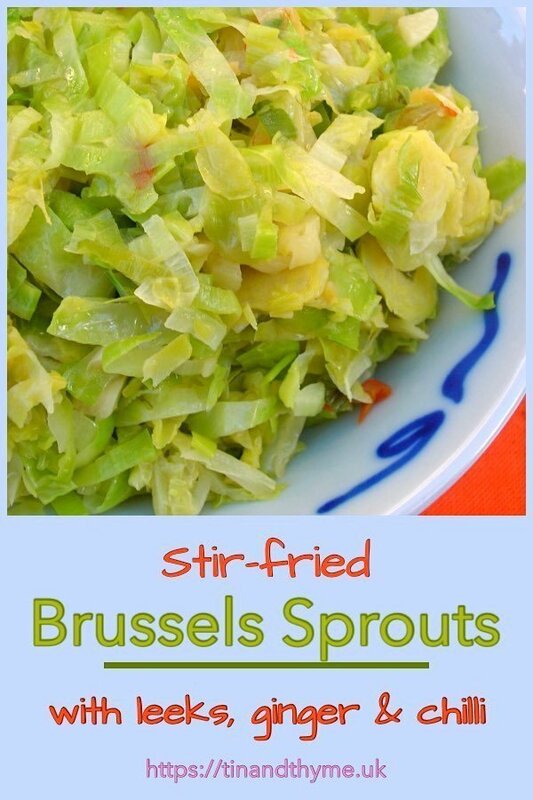 A Brussels sprout dish to spice up your Christmas meal. Fast to make and delicious to eat. 1 thumb sized lump of root ginger - peeled and cut into fine strips. 1 red chilli - deseeded and finely sliced. Heat 1 tbsp coconut oil in a large pan or wok to a medium high heat. Throw in the ginger, garlic and chilli and stir fry for a minute. Add the leek slices and stir fry for a couple of minutes. Add the sprouts and a pinch of sea salt and stir fry for 3-5 minutes until done. Squeeze in the lime. Stir and serve. Enough for 4 as a side or 2 as a main. Thanks for visiting Tin and Thyme. If you make this recipe for stir-fried Brussels sprouts, I’d love to hear about it in the comments below or via social media. Do share photos on your preferred social media site and use the hashtag #tinandthyme, so I can spot them. For more delicious and nutritious recipes, follow me on Twitter, Facebook, Instagram or Pinterest. Stir-Fried Brussels Sprouts. PIN IT. I probably make lentil dhal more than any other dish, so it’s good to have something a bit different to go with it. I love them, raw, baked or stirfried! This looks healthful and delicious. Shamefully I am the only person in our household who loves brussels sprouts! And I insist on making them every year even if I am the only one who will eat them. Haven’t tried them stir-fried it looks like a recipe I HAVE to try! I blame school dinners. They put me off so many foods that I had to learn to love again as an adult. I need to liven up my sprouts and this looks like such a tasty and healthy way to do so! Will try it for sure with my next bag. I always thought that I hated sprouts, turns out I just hate boiled sprouts. This sounds like a great way to spice them up. Thanks Claire. School boiled sprouts were the very worst, but they managed to spoil just about everything. Oh yum, these look fabulous Choclette – I’m with you on stir-frying sprouts, I just can’t bear them boiled but somehow they are totally transformed when stir-fried! Your flavours sound fantastic. Thanks Kate. I’m quite happy with barely cooked boiled sprouts, but done like this they really doesn’t taste “sprouty” at all. I initially read the recipe as 25kg of sprouts! LOLOL! I loathe boiled and steamed sprouts but yes, stir-fried (and roast), they totally rock. I love the idea of cooking them with leeks and ginger – this is going on my to-do list for sure! Yum! I really love brussels sprouts but I usually just roast them. I’ve never thought about stir frying them! Roasted sprouts are delicious too Liz, but stir-frying makes a nice change. I think this might get my boys eating them. I love them although I do remember a time when I didn’t. I think our taste buds grow up just like the rest of us! For sure Elinor. There are lots of vegetables I really like now that I pulled faces over when I was young. Stir-frying seems to stop sprouts tasting too sprouty I find.